Today’s word is daks tops and unless you’re very familiar with bespoke suiting then this should be new to you. They are very similar to side straps in that they are adjustable around the waistband preventing your pants from falling down but daks tops are much less common. They have a elastic band that runs along the back side of your waistband and is buttoned on the sides. The elastic stretches to hug you perfectly and the buttons can often times be buttoned into one of two holes making the fit even more precise. 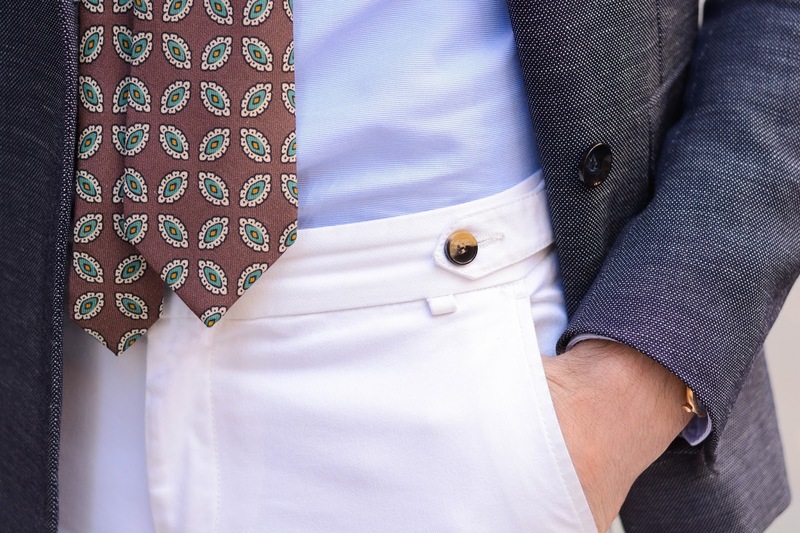 This eliminates the need for a belt and will create that clean line look that I always preach about. If you’re looking for daks tops trousers in your department store than you’ll be out of luck. This feature is almost only found on bespoke pieces but if you’re already going throughout the process of bespoke then this is definitely something to consider.